At work we are participating in an Angel Tree for St Jude's Ranch - family homes for abused, neglected or orphaned children. I chose two boys aged 8 and 13 that live in the same home. The foster parents interests are the activities that they involve the kid in. The house I chose must have a music teacher or musically inclined parent as both the boys wanted ukuleles and guitars. One of the local music stores I shop at for violin music, had ukuleles for about $60 bucks about a month ago. Real ones not junky toys. I went in there yesterday to pick up one for each of the boys in there favorite colors - red and blue. They were on sale for $42 - SWEET!!! I asked one of the salesman for help. Explained I play violin, hubby plays guitar but have no clue about ukuleles and why I was buying them. He helped me pick out a beautiful electric blue and bright red ukulele and tuned them for me. When I went to check out, he told the clerk to give me an extra 10% off since I was doing something nice for someone else he would do something nice for me. So $37.80 each. SCORE!!!! Every penny counts so... Had a $10 off coupon for Sam Ash and picked up a 3/4 size guitar for the 8 yr old and a nice full size guitar for the 13 yr old. My husband and I will be tuning them up and getting them ready to go to work tomorrow. I know that they are anonymous gifts but I wish I could be a fly on the wall Christmas morning.... Two boys are going to have a very musical Christmas. This is so amazing! Thank you for your generosity and for spreading the love of music! I'm excited for them! I love to see stuff like this. It makes me smile really big! Approaching 71 years old and I still laugh at "Sanford and Son" and cry when I hear the "Star Spangled Banner". This story goes in the column with the "SSB". What a wonderful gesture on the part of you and your husband. I'm sure the boys will be excited Christmas morning and I know this will brighten your Christmas as well. Not to make you cry again but... My daughter would've been 16 years old this year. Instead of getting depressed at this time of year and missing what I don't have, I try to find ways to help others that are here. An attitude of gratitude helps me get through. For me, doing things like this are the real reason for the season. I am richly blessed and love that I am able to share what I have with others in need. Now to make you laugh... When we were setting up the instruments, I came to the conclusion that the ukulele is the "moped" of instruments. Fun to play with but you wouldn't want your friends to see you do it. I may actually get one for myself. They were a blast and easy to play. 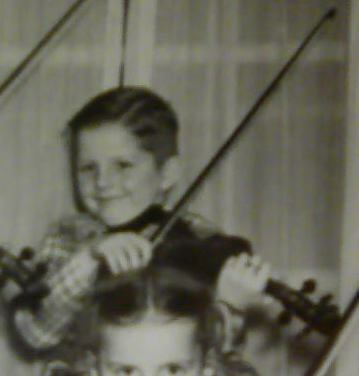 @ NewFiddlerGirl: When I was a young boy, 8 or 9 y/o, I was still playing violin at that time. I got my hand's on a Ukelele that my grandfather picked up somewhere. Well, I played it for quite a while and somehow the body got broken. I still wanted to play so I used an R.G. Dunn cigar box and attached the neck to that and made a cigar box Uke. It was fun to play and sounded really good. So don't feel silly if you buy a couple for you and hubby to play, many famous people have and still play the Uke. The two Uke's I have, one is the size of Godfrey's and one is the size of Israel's. Not sure how far back you go or can remember, but here are a couple famous people who played the Ukelele. Arthur Godfrey and Israel Kamakawiw'ole, Hawaiian born native.